At 38 weeks today, we are still awaiting the baby’s arrival. I guess I get to be one of the “lucky” ones that walk around for 3 weeks dilated, but no actual progress is being made. That’s ok though because had Cecilia come last week we would have missed out on our final baby shower. After a baby shower brunch, a vintage burlap and lace baby shower thrown by my family, and now a children’s book themed baby shower thrown by my work family, we are definitely much more prepared than we were say…3 weeks ago. I would have really been in a panic if she arrived a month ago. Although you can never fully be prepared for a baby, at least we have the necessities ready. I have been at my current job for the past three years and for the most part, our department has been unchanged. In business operations, we are a small group and luckily, I love each person in it. While I probably won’t miss drafting spreadsheets and analyzing data (ok, maybe sometimes I will because I am a math nerd at heart), I am definitely going to miss the interaction with my colleagues on a day-to-day basis. One aspect that I really enjoy about my job is being able to contribute to our community relations committee. For the past three years I have been the focal for the education portion and we have made some real strides in the community. One area that has been very successful is our Reading Buddy program at the local elementary school. The way that it works is that the volunteers from our company are matched up with one first or second grade student from the elementary school and reads with them for about an hour every week. I have been lucky enough to lead this program with a great group of volunteers and truly feel that it is a blessing on both sides. With that said, the sweet girls at work thought that a “book-themed” baby shower would be appropriate because of my involvement with our Reading Buddy program. If you have never been to a book-themed baby shower, let me give you a brief outline for how it works. Prior to our shower, I had only heard of this theme one other time and was a little confused by it. Do you just buy a book for the baby? Is that your only present? To clear up any confusion, generally speaking, when attending a book-themed shower you will bring both a present and book. Many times the book is used in lieu of a card. As a mom-to-be I am thankful for every gift that has been showered upon us. A book by itself would still be special to me. However, as a guest at one of these showers, I was glad to find out a few days before that most people give a gift with the book. As a rule of thumb, when in doubt, if you are ever invited to any kind of shower or party, bring something. You will never be embarrassed by being the only person who does bring a gift, but you might be if you are the only one who doesn’t. Now that we have cleared up any confusion that you might be having, let’s take a look at all of the darling details that went into our Children’s Book Themed Baby Shower. The excitement begins with the arrival of the invitation. 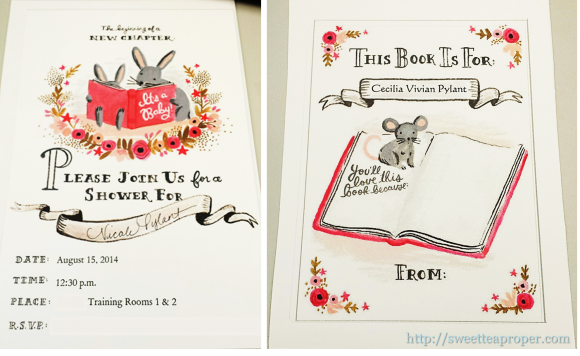 These book-themed baby shower invitations were perfect to celebrate a little girl with pink flowers lining the border and a mama rabbit and baby rabbit reading a book together in the center. My name was included by hand to the ribbon on each invitation (one of my colleagues has beautiful handwriting and could be a calligrapher on the side if she wanted to). The invitations also included a matching book-plate where the guests could write who the book was from and why the child will love the book. Once I unloaded all of the presents and books, I read back through all of the book plates again. With some sweet and some funny, this added an extra special touch to each present. 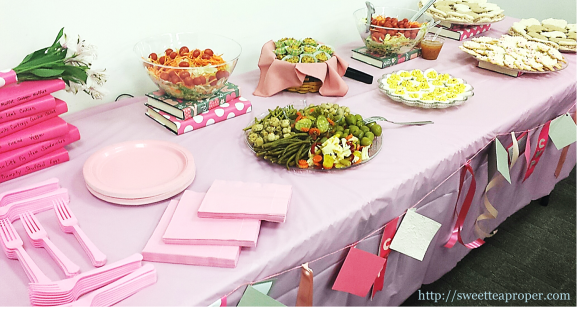 The food table was decorated with a pink tablecloth, books were covered with pink festive paper and used to add height, and a banner was draped below that contained passages from children’s stories. If my one colleague could be a calligrapher, the other one could be a caterer. We have been spoiled by her delicious treats at several meetings. 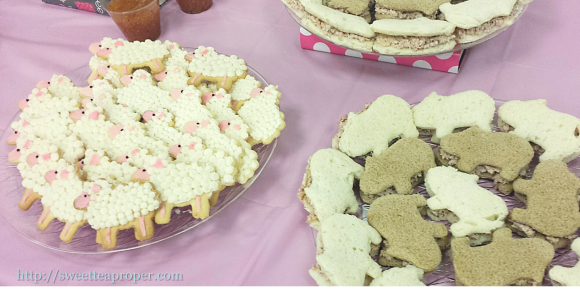 For this shower, she was the creative hand behind the lamb shaped cookies and ham sandwiches cut out to look like little pigs. 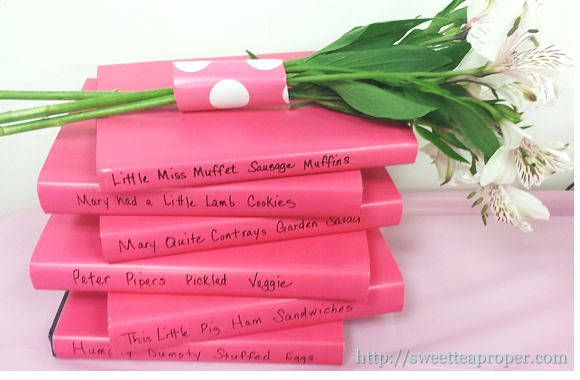 Pink covered books with flowers draped over the top were used throughout the room for decor and I just had to include another picture of those little lamb cookies. I think I had at least half a dozen…literally. 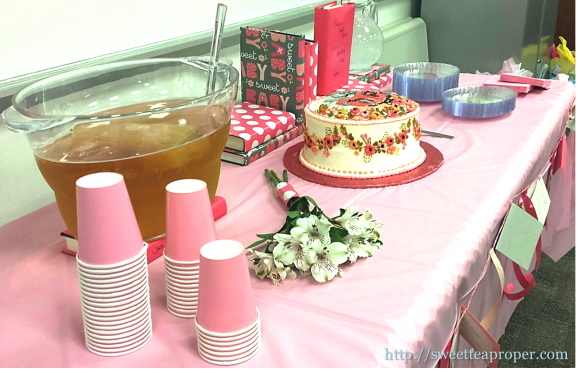 For drinks, guests could enjoy a glass of Jack and Jill Ginger Punch (apple juice plus ginger ale) and it’s not a party without a cake. This Sugar and Spice and Everything Nice cake was made by The Little Cake Shop. Coordinating with the food table, the cake table had a matching pink tablecloth, covered books serving as food labels, and a banner draped over the front (which now lovingly drapes over Cecilia’s crib as we patiently wait for her to arrive). I wanted to include one more close up of this gorgeous “Sugar and Spice” cake. 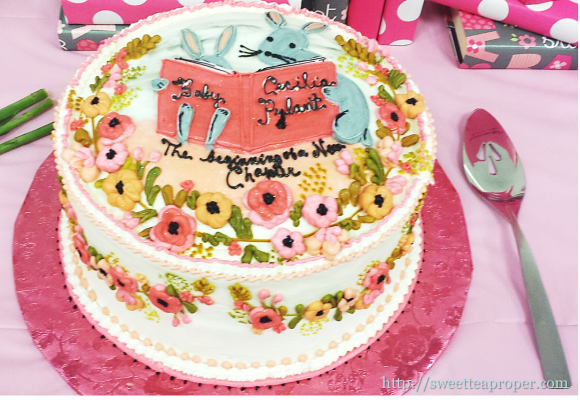 Not only was this spice cake delicious, but absolutely perfect for a book-themed baby shower. As we prepare for a new chapter in our lives, I can’t help but feel a little sad about closing this one. At our church service yesterday, someone said that “friends are family that you choose” and that is exactly what my work family is to me. I will miss them dearly and couldn’t feel more loved.